I recently went to a bloggers dinner with Greedy Diva and Gourmet Chick, and Gourmet Chick’s MR who was an honourable blogger for the evening. We went to Opera Tavern, not as guests of the restaurant, but as Aussies who love food and who just wanted to have a fun night out. Opera Tavern is located in the heart of Covent Garden and has a prime spot close to the Opera House. 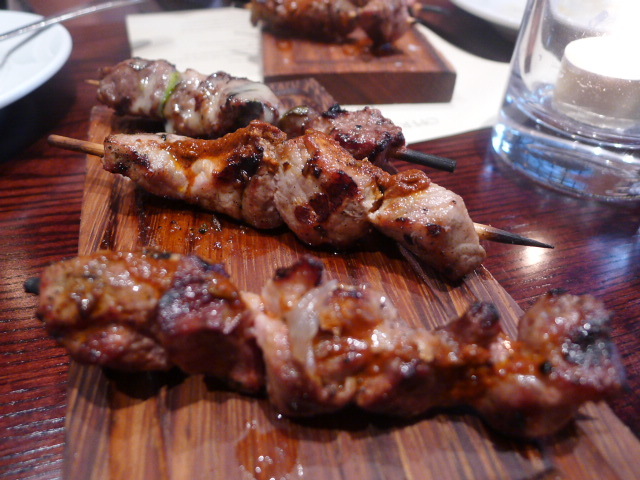 The restaurant is relaxed and inviting with a light airy feel and specialises in Italian and Spanish influenced tapas. 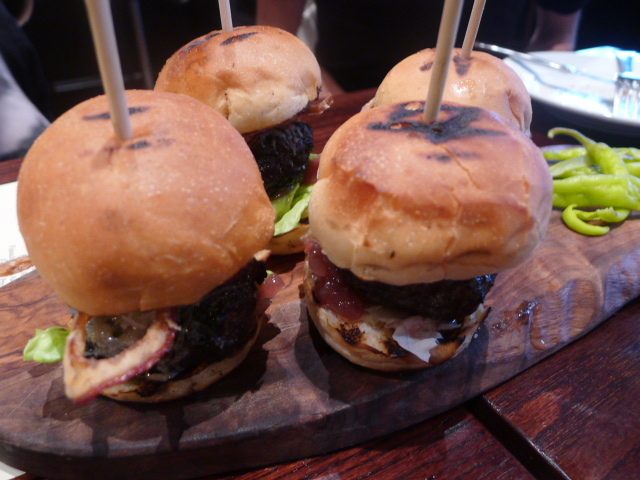 There is also a charcoal grill and headlining the grilled selection is the mini Ibérico pork and foie gras burger (£5.95) which was beautifully satisfying with its rich, fatty goodness. The bun was also enjoyable as it was light and airy. Overall this was a resounding success if a little salty. 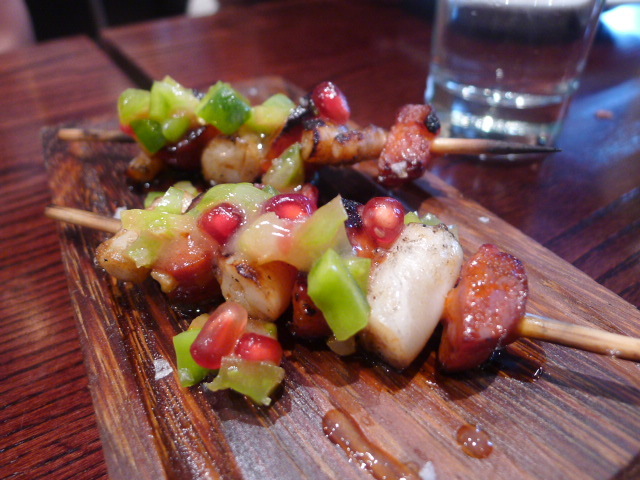 Also from the charcoal grill were some moorish (quote, unquote) marinated Ibérico pork skewers (£3.25) and octopus & chorizo with green tomatoes, cucumber and pomegranate (£3.95) which were nicely done. 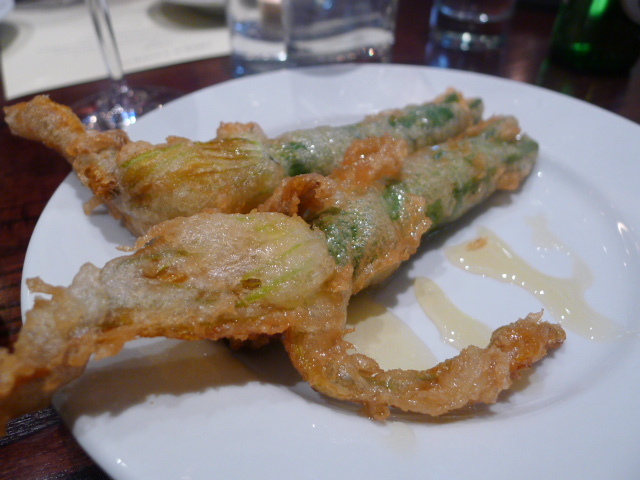 Courgette flowers (£7.55) were lovingly stuffed with goats’ cheese, the combination of which worked well. Deep fried with a crispy batter, the flower stalks were a little too crunchy and could have done with a bit more cooking. 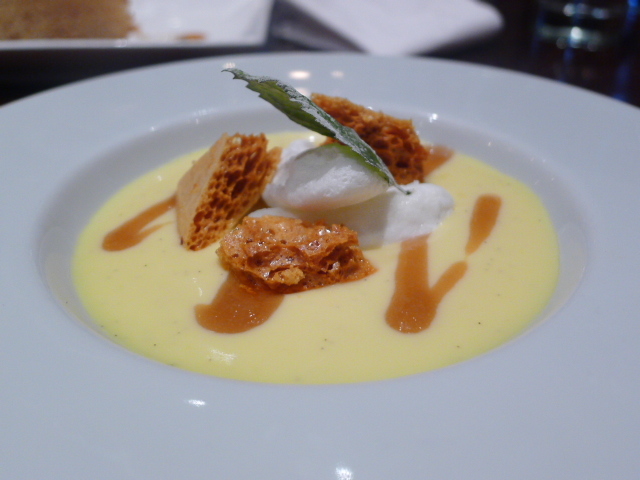 But for a nice finishing touch, there was a drizzling of honey to be had. 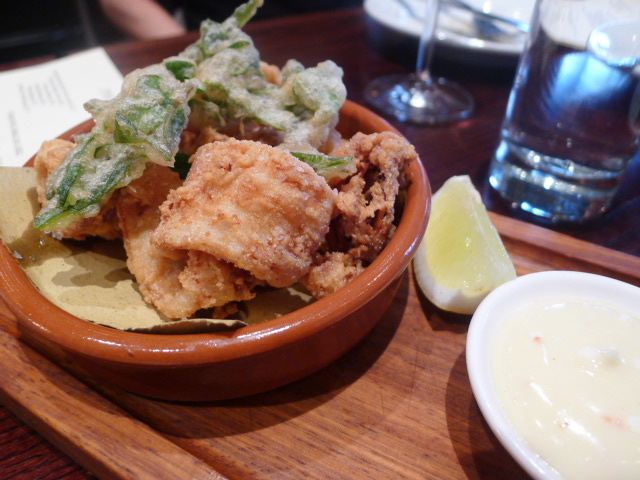 Crispy squid (£6.75) was indeed crispy, and the squid was nice and tender. But I didn’t think much of the accompanying deep fried sea purslane which didn’t taste freshly made. The chilli aioli was good, but I would have liked a touch more kick. 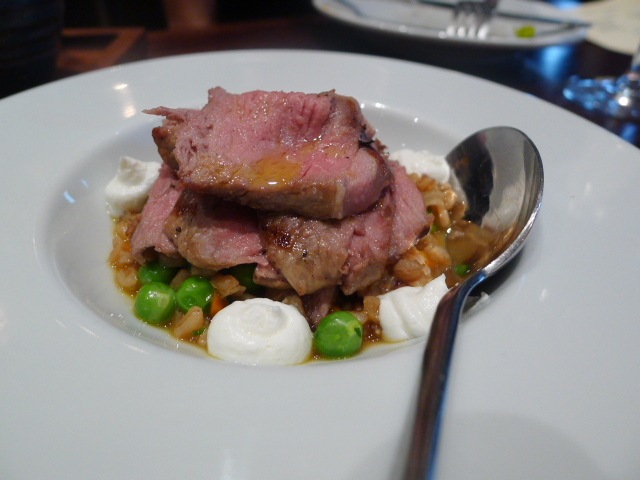 Chargrilled salt marsh lamb with farro, peas, broad beans, wild garlic and goat’s curd was particularly satisfying, especially at only £7.25 for a decent sized portion. The goat’s curd was a really nice addition to the dish. 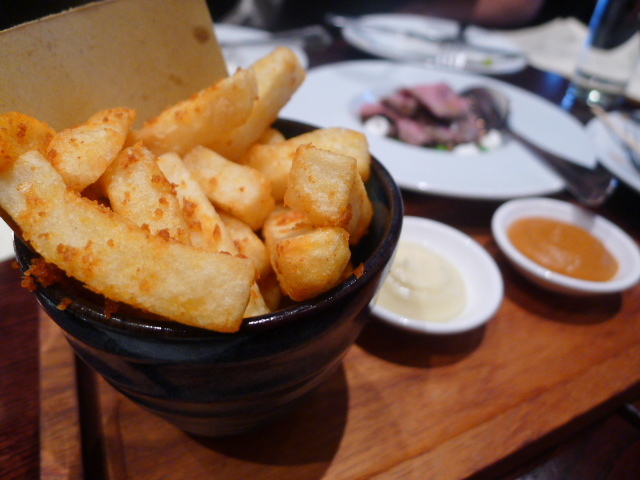 Patatas fritas (£3.75) were well made and super crunchy, if a little salty. It came with alioli and bravas sauce. 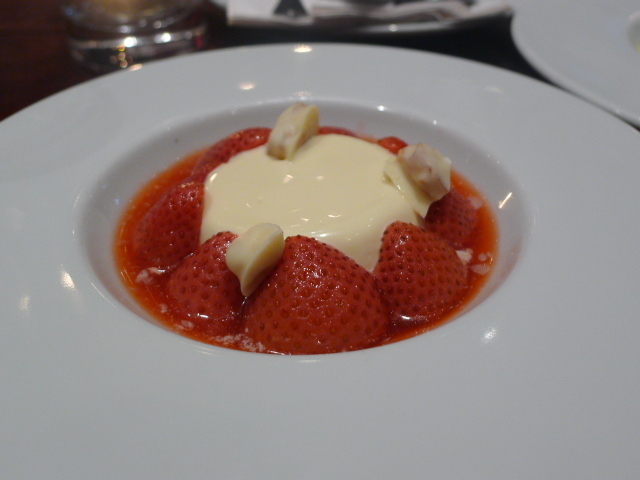 Desserts of warm hazelnut cake with lemon thyme ice cream; poached Italian meringues with new season rhubarb, saffron cream and honeycomb; and tonka bean pannacotta with English strawberries and white chocolate almonds (all £5.35) were pleasant. 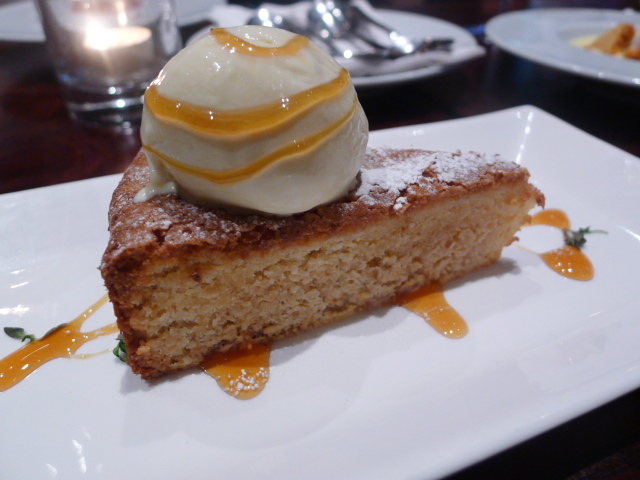 The hazelnut cake was the best of the lot with its moist texture and fragrant ice cream accompaniment. The service was pleasant and all round this was a decent meal in comfortable surroundings (and with great company). There were some slightly off moments due to over seasoning but if you happen to be in the neighbourhood, there should nothing stopping you from popping in for a bite. Price range: About £35 to £40 a head. Excludes drinks and service.